Of course your brood loves cheesy goodness. Keep it interesting with this scrumptious, hearty remix. □ Bring a large pot of lightly salted water to a boil. Add the pasta, and boil until the noodles have 5 minutes left to cook according to package directions. Add the broccoli and ham; continue cooking until the pasta is al dente and the broccoli is bright green and crisp-tender. Drain. 2 Tbsp milk with the flour in a small bowl, and stir until smooth. Melt the butter over medium heat in a saucepan; stir in the flour mirture and whisk in the remaining 1 cup milk, stirring constantly. Continue stirring until the sauce is the consistency of heavy cream, 2 to 3 minutes. Remove from heat, and stir in the cheese until the sauce is smooth again. 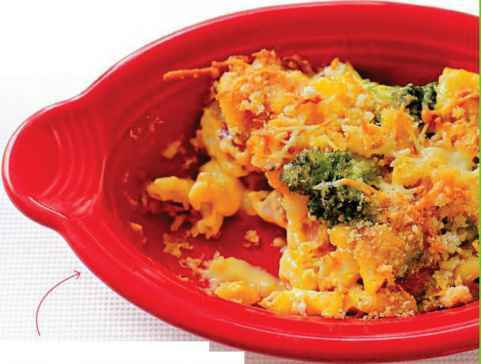 Transfer the macaroni and cheese to a baking dish coated with cooking spray. Combine 2 Tbsp melted butter with V3 cup each bread crumbs and grated parmesan cheese. Sprinkle the mixture on the pasta. Bake at 450T until the topping is golden, 3 to 5 minutes.